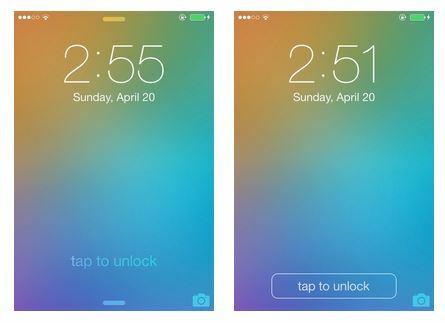 A new iOS 7 tweak has been recently released by the guy nicknamed drewsdunne. The tweak is called TapToUnlock7 and it allows you to get rid of the 'Slide to Unlock' feature and use a customizable button instead. Well, those who for some reason don't like Apple's native unlocking system will be fond of the new tweak, I guess. Are you tired of long, tedious motion of sliding your thumb across the screen? Well no worries, that is gone with TapToUnlock7! Create a custom button for unlocking your iDevice and give that thumb a break! It should be noted that the button can be easily customized by a user. One may change its color, height or width, add or remove borders or even use an image instead. TapToUnlock7 is available on the Cydia Store for $0.99. If you feel like trying to change the unlocking system of your iPhone or iPad, go and get the tweak.